Green Bay Harvest pride themselves on the quality of their raw manuka honeys and this 15+ honey is a case in point. 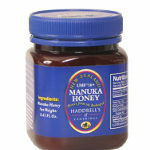 Green Bay Harvest produce a range of manuka honey. A large jar of Green Bay Harvest 15+ Active Raw Manuka Honey is filled with 100% raw honey that has not been heat treated or processed. Sourced from the South Island of New Zealand, this is a natural product filled with goodness. A classic manuka honey from a company with a commitment to sustainability. Labaratory certified 5+ Active Raw Manuka Honey from Green Bay Harvest, a raw and untreated manuka honey that is simply delicious and full of goodness. A raw and natural breakfast manuka honey from Green Bay Harvest. This 8+ active manuka honey is lab certified and has not been treated or processed so you get all the goodness in the jar. Happy Valley Manuka Honey UMF 10+ is a simply delicious manuka honey and Happy Valley is a licensed member of the Unique Manuka Factor Honey Association, meaning this is a certified and tested manuka honey. Happy Valley is a top class manuka honey producer that is certified by the Unique Manuka Factor Honey Association. This Manuka Honey UMF 10+ is a fantastic example of a manuka honey with a strong and intense taste. Happy Valley Manuka Honey UMF 20+ is a rare manuka honey from a licensed producer. It has one of the highest UMF ratings available and is a delicious way to experience one of the most amazing superfoods on the planet. Happy Valley Manuka Honey UMF 20+ ranks as one of the top manuka honeys available. The high UMF rating makes this an uncommon and rare species as well as a delicious one. Happy Valley is a certified producer of manuka honey and this UMF 20+ has been tested independently. If you can't keep your sticky paws off this delicious manuka honey then why not go for this 1 kg jar of Happy Valley Manuka Honey UMF 5+. It's certified and deliriously delicious.